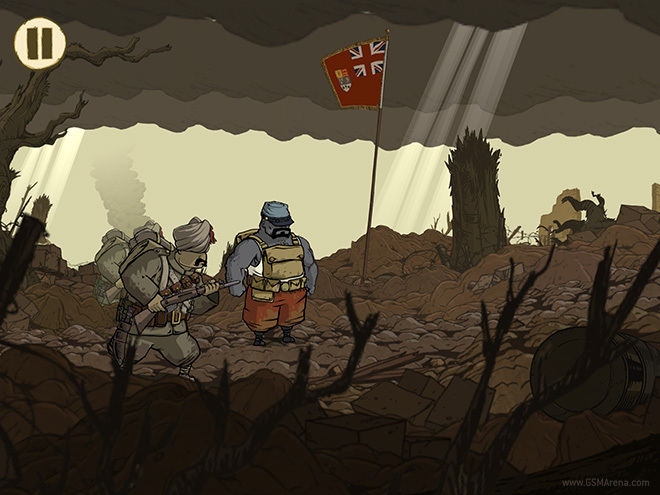 Valiant Hearts takes place during World War I, and you play as four characters and try to get a soldier back to his wife and child. The game is known for its art style and storytelling. The simple gameplay style always made it conducive to touchscreen devices and now it’s finally here, so let’s take a look at it. 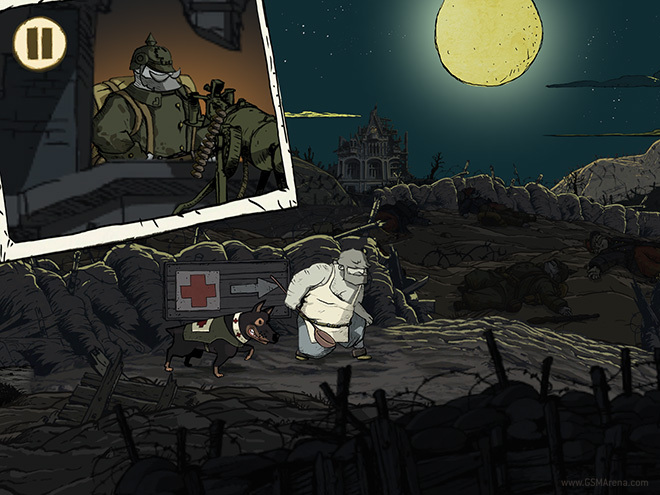 Valiant Hearts is a 2D side-scrolling game. On iOS, you move by tapping or tapping and holding on the screen to move the character where you want. You can jump by swiping up, attack by swiping sideways, and throw objects in a very Angry Birds style interface. Objects that can be interacted with have a popup when you get close to them and you can tap on it to interact. 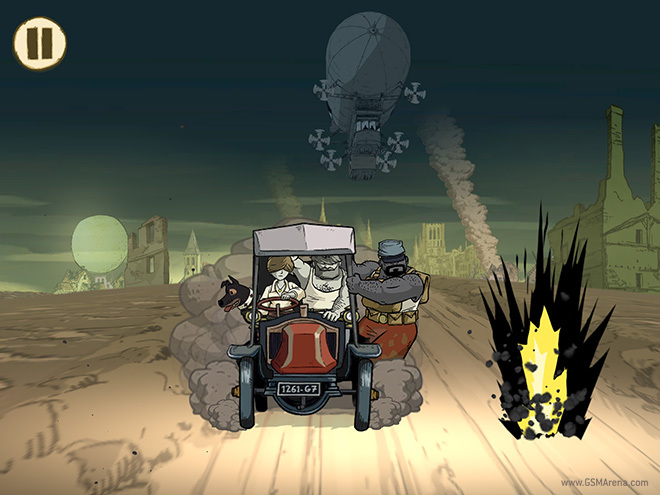 The gameplay is a mixture of action and puzzle solving, with more of the latter. Action doesn’t imply you get into a fistfight or shoot people but occasionally you toss grenades and stealthily attack people by sneaking up from behind them. The puzzles usually involve pushing a lever or moving an object. One of the characters has a dog, who can be tasked to do certain tasks that the character can’t do himself. The dog can be used to fetch objects or push levers for you. The puzzles with the dog are the best and the ones that involve the most thinking. Still, none of the puzzles are particularly perplexing and with a bit of thinking can be figured out easily. And in case you can’t there is a hint system as well. I did struggle with the controls a bit. On initial impression they seem fine but as you play further you notice that it is often difficult to move the characters and also tap on the objects. Often making the characters tap on a popup makes them move, and sometimes when you’re trying to move them they end up interacting with something. Some of the swipe gestures to attack or dig are also hit or miss, sometimes getting triggered when you don’t want to and other times not working when you want them to. 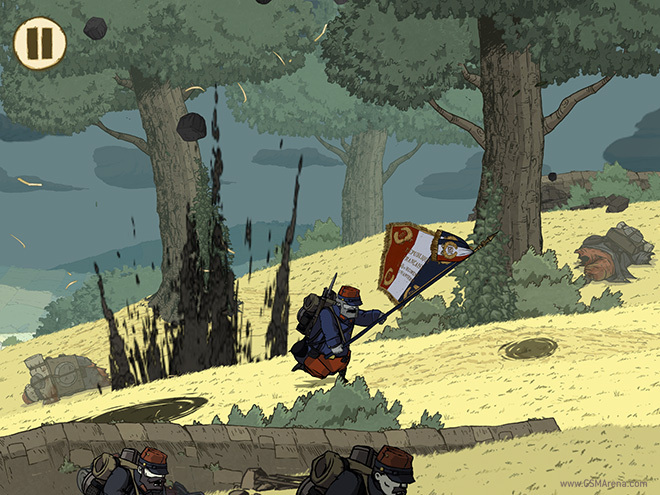 Valiant Hearts puts a lot of focus on the characters and indeed the characters in the game are some of the best you’ll come across. They are all likable, good people, trying to survive in hard times and helping each other out. There are some dialogues in the game but most of the times the characters converse in unintelligible words. Despite that, you find yourself more attached to these 2D, barely understandable characters and their hardship than the high resolution 3D characters with super accurate facial expressions voiced by famous people of many AAA titles. 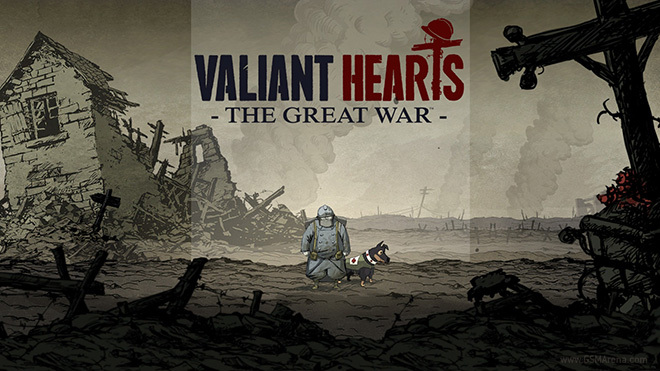 Valiant Hearts is split up into four episodes, with each about a couple of hours long. When you purchase the game, you only get the first episode and the others are an IAP that can be purchased individually for $3.99 each or all three together for $8.99. However, if you play the first episode, the game gives you a discounted price of $6.99 for the other three episodes if you purchase it in 48 hours since completing the first episode. This does push the price of the full game up to $12 (or $14 without the discount) but it’s well worth the price. 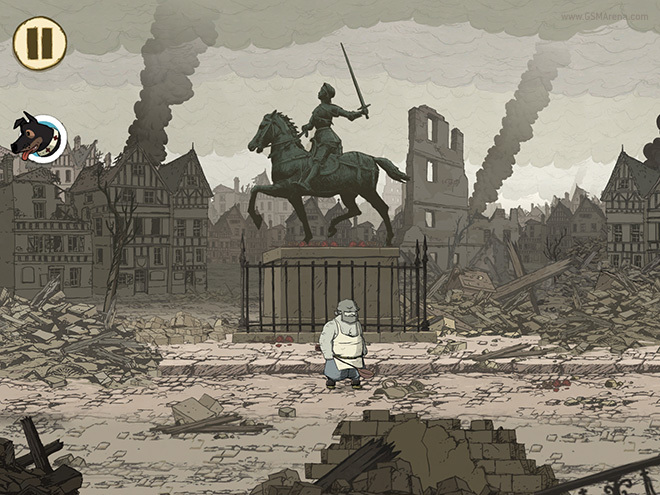 Valiant Hearts is rendered in beautiful hand-drawn 2D animation. Except in a few cases when the game zooms in on something, which is when the animation doesn’t scale up in resolution accordingly and thus just ends up looking blurred, the game looks sharp and fantastic on Retina displays. The high resolution graphics really bring out the best in the wonderful animation and art style of the game. The music in the game is also wonderful. It always manages to capture the tone of the level and works brilliantly with the excellent animation in the game. The few dialogues in the game and all the sound effects are also great. 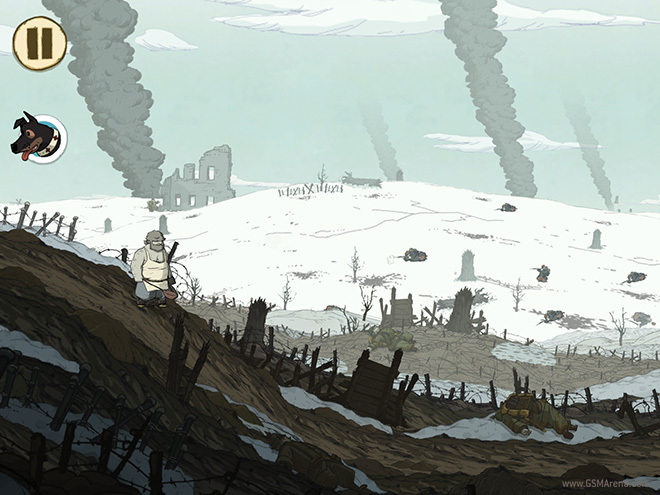 I wouldn’t hesitate to call Valiant Hearts: The Great War a work of art. The game looks and sounds amazing and I loved the gameplay, story and the characters. This game would have been perfect on the consoles or the PC but it lost some of its magic in translation to the touchscreen. The controls aren’t as precise as I’d have liked them to be and are the only sore point on an otherwise great game. Still, I wouldn’t stop anyone from purchasing the game based on that one shortcoming along and it’s certainly something you can deal with. But if you have access to the other platforms, then it would be better to purchase it there. Either way, this game is a must-have.